Instructions: Ready top fold card measures 7.5"x 6". To prepare mats choose pattern paper from the designer paper collection and cut two pieces measuring 7.25" x 5.75" and 7" x 5.5". Layer the mats on the ready card base. Cut two pieces from the white card stock using Eyelet Border Basics Die and glue them as shown. Cut five pieces of heart from the white card stock using eyelet heart's die. Also cut a heart from acetate sheet. Stamp hand-stitched background on acetate sheet using Versamark and heat emboss it with white embossing powder. Create shaker heart. 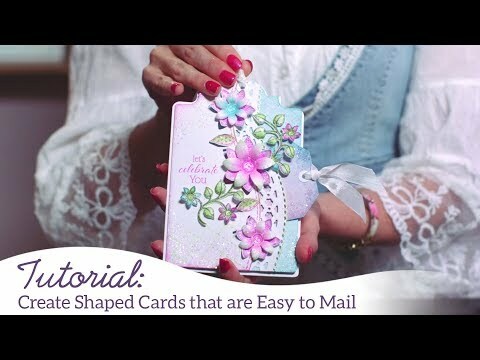 Glue the shaker heart on the center of the card as shown. Stamp patchwork daisy on the water color paper using black Archival. Also stamp flower from the buttons and blooms stamp. 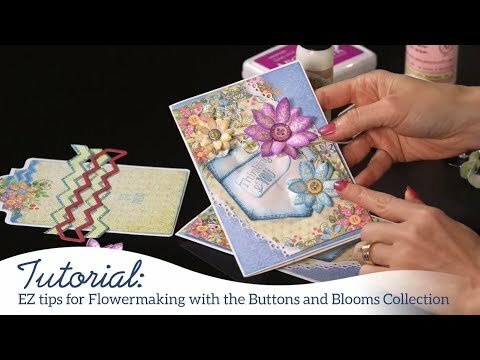 Color the images using Zig markers die cut with coordinating dies. Slightly shape the flower, apply Crystal Lacquer on the center of the flower and add glass fragments. Arrange flowers as shown. Tie a bow using satin white cord and glue it. Stamp love sentiment using Plum Archival on the white cardstock and cut with coordinating die. Cut four more pieces from a white cardstock using the same die. Layer the letters together to give it a 3D look. Glue some flat back pearl on the center of the flower and on acetate heart as shown.